The Gerber Recon-M II model 31-000505 uses two CR123 batteries that can output 40 lumens of light for over 60 minutes. This is quite a feat and is only possible thanks to the regulating circuitry inside the flashlight, which is designed to provide consistent output. 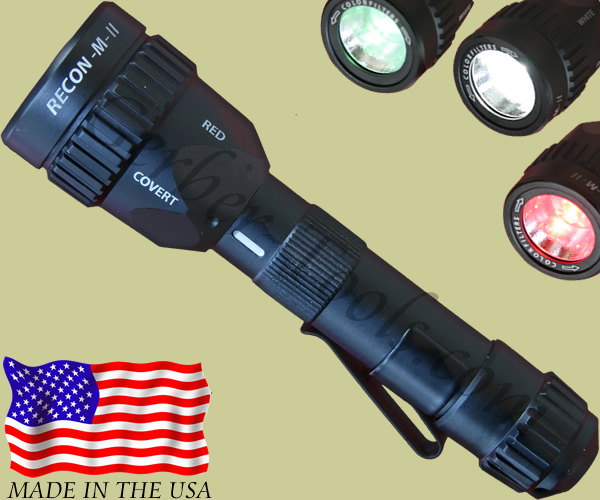 The Recon-M II has filters where the user can easily select betwen red, white, and NVIS. Extra large knurling is provided so you do not have to remove your gloves when operating the light. An aircraft aluminum body provides sturdiness while rubber seals keep the light weather proof. The Recon-M II just under 5 oz and is MADE IN THE USA.